19 Tamil National Alliance (TNA) parliamentarians led by Mr. R. Sampanthan, Leader of the TNA Parliamentary group and Member of Parliament for Trincomalee district, protested Thursday at 11:00 a.m in front of United Nations office in Colombo condemning the Sri Lanka Army (SLA) bombing of Internally displaced persons (IDPs) in Vaharai and Kathiravelli, killing 53 civilians and seriously injuring 127, sources in Colombo said. 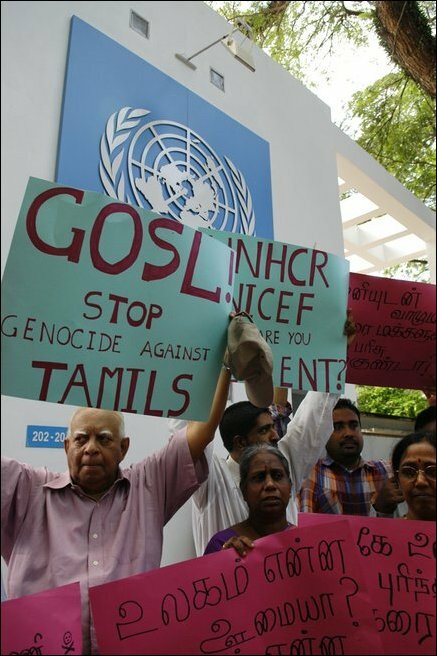 The protesters urged the United Nations to urgently intervene to stop the "genocide against Tamils let loose by the Sri Lanka government." 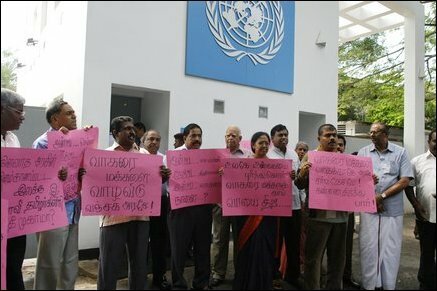 Sri Lankan Parliamentarians of Tamil National Alliance carries the placards and held the demonstration against to kill Tamil civil people, at front of the UN office in Colombo on Thursday. TNA parliamentarians Mavai Senathirajah, Thurairatnasingham, Ariyanenthiran, Suresh Premachandran, N. Raviraj, Pathmini Sithamparanathan, Sivanesan, Pathmanathan, Thankeswary, Selvam Adaikalnathan, Sivasakthy Anandan, Kanagasabai, T. Jeyanandamoorthy, Chandrakanthan, and Gajendran participated in the protest, sources attending the demonstration said. Mavai. 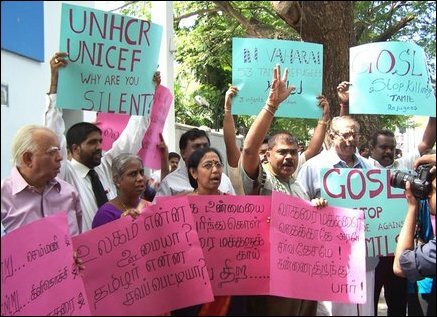 Senathirajah and S. Jeyanandamoorthy accompanied Sampanthan and submitted the memorandum to the UN residential representative. "The UNHCR, UNICEF, UNESCO and other World Organisations remain silent while the Sri Lanka Army (SLA) perpetrates violence on the Tamils. The silence encourages the SLA to continue its atrocities against the Tamils unquestioned, we told the UN residential representative," said T. Jeyanandamoorthy. "We also told how our non-violent protest in the Parliament is being ignored by the Sri Lanka government and pointed out that Tamils were driven to take arms because their non-violent struggles were ignored by successive Sinhala governments," added the MP.